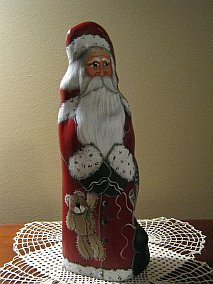 This is another vintage rolling pin Santa. It is an olive green with candy cane fur trim. He holds a gingerbread cookie. 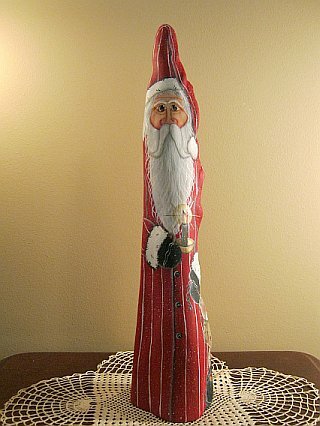 This sleepy Santa has been hand painted on a 17 3/4" cypress knee with a 4" base. His nightshirt is bright red with white stripes. With candle in hand, he is off to bed, but first he'll have to wrestle his teddy bear away from Fido. 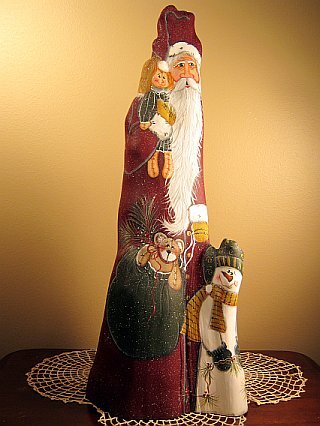 This Santa is only 13" tall. He wears a Christmas red robe with white fur trimmed cape. He holds a toy bag that is loaded with a baseball, a bat and a doll house in one hand and a teddy bear in the other. 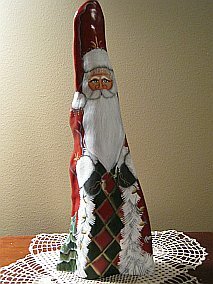 This 20" tall cypress knee with a 11" base has been handpainted as Santa wearing a black cherry robe with gray, gold and white accents. He carries a loaded gold toy bag. This is my adaption of a design by artist Nancy Bateman. 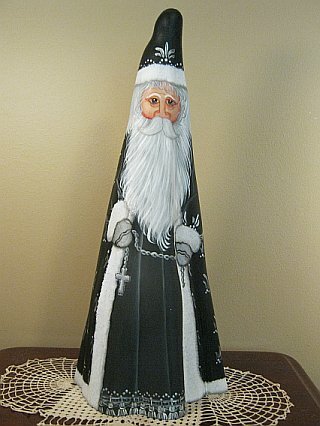 This 19" cypress knee has been hand painted as a Santa wearing a black robe with silver accents. His charcoal underskirt is trimmed with silver and white fringe. In one hand he carries a silver cross on a long chain. 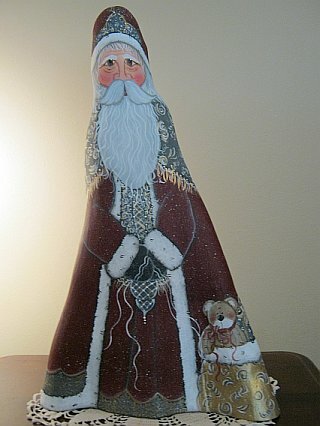 This cypress knee has a 19" tall Santa and a 17" snowman on a 8 1/2" base. Santa's wearing a Christmas red robe with a pine needle underskirt. He and Sam the Snowman are holding a garland of greenery. Sam is wearing a matching pine green cap and mittens with a red scarf. 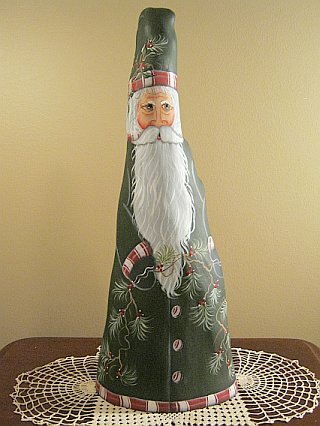 This one of a kind cypress knee features an 18" tall Santa wearing a dark forest green robe accented with candy cane trim. He holds a pine garland in his hands while a sprig of the garland accents his cap. 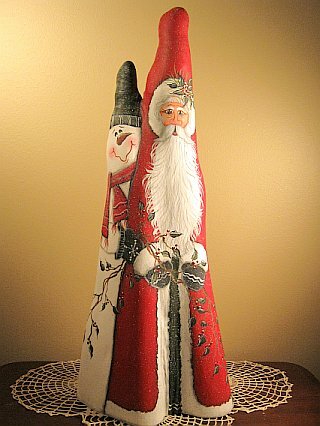 This cypress knee has a 20" tall Santa and a 8" snowman on a 8 1/2" base. Santa's wearing a black cherry robe. He's holding a doll in one and a toy bag with a teddy bear peeking out. Sam is wearing a matching pine green cap and mittens with a mustard and green scarf. He holds a pine garland. 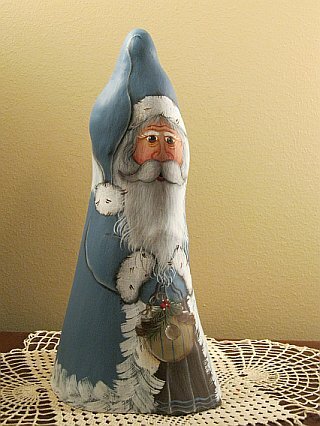 This 11 1/2" tall cypress knee with a 6" base has been handpainted as Santa wearing a Williamsburg blue robe with a burnt umber underskirt. He carries a beige birdhouse. 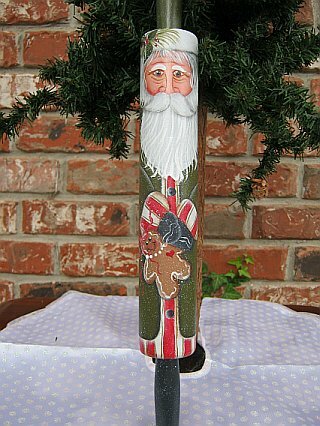 This 16" tall cypress knee with a 6" base has been handpainted as Santa wearing a Christmas red robe and a green and red argyle underskirt. He carries a string of lights to add to his small Christmas tree.